Sulfur Recovery Units - BORN Inc.
BORN is proud to announce the recent completion of fabrication and shipping of two 3-Tier Sulfur Recovery Units. These units were fabricated to the client’s approved Inspection and Test Plan covering the relevant ASME Codes and Standards and were fully complied with the Department of Occupational Safety and Health Administration (OSHA). 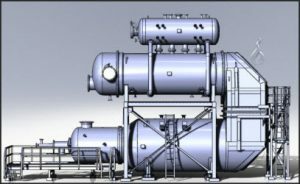 The 3-Tier Sulphur Recovery Unit™ conceptualized and designed by BORN recently, exemplifies BORN’s continuing leadership in innovations when it comes to meeting client’s requirements without compromising on process efficiency, quality standards and on-time delivery. BORN has been designing Sulfur Recovery Units (SRU) since 1989 and has over 24 years’ experience in both COPE Process and SuperClaus Process. The COPE Process recycles part of the process vapors from the first sulfur condenser back to the main burner on the combustion chamber while replacing nitrogen in the air used for combustion of the hydrogen sulfide with oxygen, thus increasing the capacity of the SRU. The SuperClaus Process uses a special catalyst to promote the direct oxidation of hydrogen sulfide to sulfur. The process adds air to the dilute reactants after a number of Claus reactors and sulfur condensers. The SuperClaus reactor achieves greater sulfur recovery efficiencies than another Claus reactor alone would achieve, thus increasing the overall sulfur recovery for the plant. Each 3-Tier unit was equipped with a combustion burner, combustion chamber, turning plenum, waste heat boiler and steam drum. 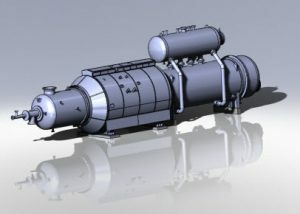 Generally, the combustion chamber and the waste heat boiler are arranged in a horizontal configuration. In this 3-Tier design, the waste heat boiler is stacked above the combustion chamber and connected by a turning plenum to minimize the overall footprint of the unit. The gas side of the unit was provided with internal refractory. The water side was externally insulated. Rain shields were used to maintain the shell temperature in a specific range to prevent sulfur attack. The units were provided with spring supports to allow for movements due to thermal expansion. BORN met the Quality Management System, as per the requirements of ISO 9001: 2002. This incorporated a system as per ISO 10005: 2005 which covered all work processes from purchase to the final transportation. This also included compilation of all Manufacturing Data Records. Fabrication of the Units fully complied with client supplied Standards and Specifications. The units were test-assembled at the fabrication shop, pneumatically tested and certified by authorized inspection agencies prior to the shipment.